Is Chess the only boardgame? When you mentioned the word "boardgame" my eyes went immediately wide open. I thought about the thousand boardgames that are listed in boardgamegeek.com . I thought about playing "Settlers of catan", Carcassone, and others, like in www.brettspielwelt.de . But you only think of chess and checkers! Well, it's a beginning, though it could get better. *Much* better. Re: Is Chess the only boardgame? You made me gasp with The Settlers. Would definitely be cool. There is pioneers (I think pioneers.sf.net) but the AI isn't great and there aren't ever any people online to play with (probably because it is linux only). I must be the only one on the planet who finds Settlers extremely disappointing. Other than the fact that it allows me to shout "I have wood for sheep!" it is too simplistic for my taste. I might prefer network play, but when you play with your buddies, you learn their strategies (who goes for longest road, who tries for armies, etc) and what you should or shouldn't trade them. Personally, I'd love to see huge, extremely dynamic games like Talisman get ported someday. Surely their strategies depend on the game situation? Maybe you should get some better friends! Is this project aiming to be compatible with GGZ http://www.ggzgamingzone.org/ ? I hope it grows to be as varied as the now defunct GTKBoard. Best of luck to the developers. 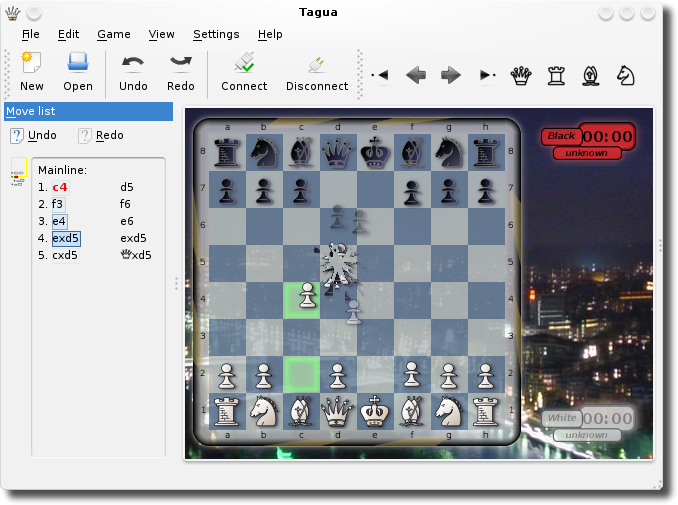 to when a Game of Go for KDE4 ? qgo (http://qgo.sourceforge.net/) is nice but far from the KDE4 style. Re: to when a Game of Go for KDE4 ? tagua will do it, probably. every PvP information complete board game could finish there. classical ones like Go are the most probable.